Whispering galleries are curious features of circular buildings. As whispers travel along the buildings’ curved walls, they remain loud enough to be heard clearly on the other end of even a large room. New research suggests we all carry a couple of them around in our heads. Inside their inner ears, mammals (but not other animals) have cochleas—coiled shell-like tubes in which incoming sound energy tilts sensory hairs, generating electric signals to the brain. 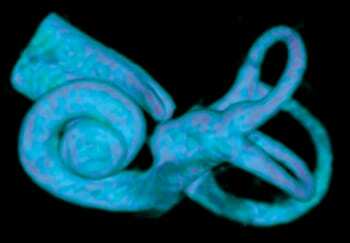 Scientists thought coiled cochleas evolved as a way to pack a longer tube length into the available skull space, giving mammals better low-frequency hearing than other vertebrates, which lack cochleas. 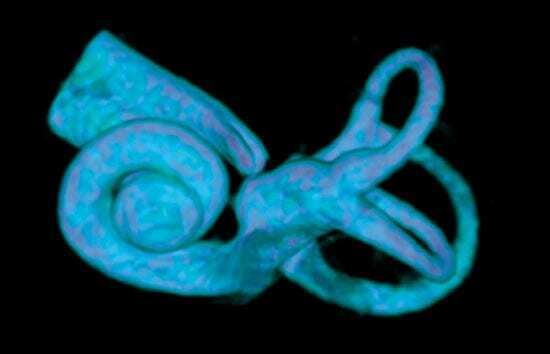 To test the idea, Darlene Ketten, a biologist at Woods Hole Oceanographic Institution (WHOI), and WHOI researcher Julie Arruda provided high-resolution CT scans, taken at the WHOI Computerized Scanning and Imaging Facility, of cochleas from 13 different land and marine mammal species. They included creatures whose hearing abilities are well-documented, ranging from an elephant, mouse, and human to a sea lion and a bottlenose dolphin. From the CT images, Ketten’s group made precise geometric measurements of all the cochleas and sent the images, drawings, and data to a research team led by Daphne Manoussaki, a mathematics professor at Vanderbilt University, and Richard S. Chadwick of the National Institute on Deafness and Other Communication Disorders, who calculated the cochleas’ curvatures. They found that the less tightly wound the spiral in an animal’s cochlea (or put more mathematically, the broader the ratio of its curvature), the lower the frequency of sounds the animal could hear. The findings suggest that lower curvature improves the focus and penetration of lower-energy, low-frequency sound waves along the inner ear walls, channeling sound more efficiently to the cochlear tips and making sounds more audible—just as in a whispering gallery. The research, published April 22, 2008, in the Proceedings of the National Academy of Sciences as the featured news item, could be extrapolated to improve understanding of hearing (and the impact of human-made noises) in animals whose auditory abilities remain unknown, such as tigers and polar bears, and even extinct mammals, such as land and aquatic ancestors of whales, saber-toothed tigers, and woolly mammoths, whose cochleas are often preserved as fossils. This study was funded by the National Institutes of Health, Vanderbilt University, the Technical University of Crete, and the Office of Naval Research Marine Mammal Program. A research team has found seafloor microbes—growing without light and eating fresh volcanic rocks—that are flourishing with greater abundance than most scientists thought possible. The bacterial communities in oceanic crust were as fertile and prodigious as those found in soil on farms. “We were truly shocked to find microbial life thriving at the levels we observed,” said Cara Santelli, a recent graduate of the MIT/WHOI Joint Program and lead author of a study published May 28 in the journal Nature. Santelli conducted the research with geochemists Katrina Edwards (University of Southern California) and Wolfgang Bach (University of Bremen) while all three were at Woods Hole Oceanographic Institution, as well as collaborators from Western Washington University, the Marine Biological Laboratory, and Scripps Institution of Oceanography. The findings raise new questions about the evolution of life on the seafloor and on Earth. Marine plants need iron to grow, so scientists have long wondered how the element gets into the ocean. Now, they have found an important, previously unsuspected source. Scientists have assumed that phytoplankton blooms are fertilized by iron-containing dust particles blown off continents and out to sea by wind, or by iron-rich waters from the deep sea that are brought up to the sunlit surface by currents. But iron in seawater samples collected on a 2005 research cruise in the northwest Pacific Ocean clearly did not come from these two sources. James Bishop of the University of California, Berkeley, and Phoebe Lam of Woods Hole Oceanographic Institution found high concentrations of particulate iron 100 to 200 meters beneath the surface. The iron was far less oxidized than it would be if it came from dust from Earth’s surface. 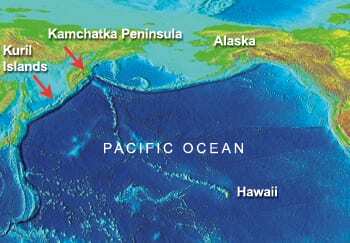 Instead the iron was characteristic of volcanic material from the margins of the Kamchatka Peninsula and the Kuril Islands. The scientists say the iron-rich material originated in sediments at these margins and traveled out to sea along a dense, deep-water layer. Storms or currents can bring the iron up toward the surface for use by plankton. “We suspect this is the case for the iron supply in other, similar regions of the oceans,” Lam said. The study was published April 2008 in Geophysical Research Letters. 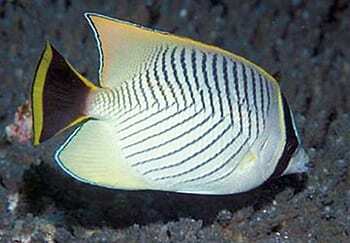 A beautiful black, white, and yellow butterflyfish, much admired by divers and aquarium keepers, may be at risk of extinction, scientists have warned. Prachett and Michael Berumen, a biologist at Woods Hole Oceanographic Institution, found it hard to believe a fish would starve rather than eat a mixed diet, so they tested a particular species of butterflyfish in tanks on a range of different corals. The fish grew well when its favorite coral was available, but when this was removed and other sorts of corals offered, they grew thin, and some died. Plate tectonics revolutionized the understanding of our planet, explaining how new crustal material rises from Earth’s mantle, spreads across Earth’s surface, and returns to its interior—in a continuous, conveyor-belt-like process that rifts continents, opens and closes oceans basins, and creates mountains. Now two scientists have added a revolutionary wrinkle: The crustal conveyor belt may stop and start, said Paul Silver of the Carnegie Institution of Washington and Mark Behn of Woods Hole Oceanographic Institution in the Jan. 4, 2008, issue of the journal Science. Silver and Behn calculated that the Earth could not always have released heat from its interior as fast as it is doing today (or else Earth’s surface would have been entirely molten in the recent past). Assessing isotopic data in ancient rocks, they found that the Earth virtually stopped releasing heat about 1.5 billion years ago. Their explanation? Plate tectonics temporarily slowed or ceased, clamping a lid on escaping heat.